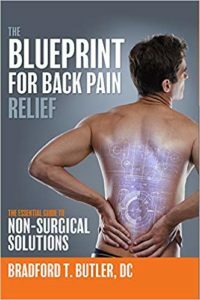 Dr. Bradford Butler’s new book, The Blueprint for Back Pain Relief: The Essential Guide to Non-Surgical Solutions, shares what his 20 years of continuous pursuit of quality of life for his patients has taught him. Dr. Butler’s motivation for The Blueprint for Back Pain Relief: The Essential Guide to Non-Surgical Solutions is to help everyone by laying out life-changing information that has improved the lives of thousands of patients stuck in that same cycle of pain and frustration. The book is able to share the information in easily understandable language that can give you tools to live by. Butler shares how, without drugs, he has helped patients recover from neck and back pain. He has treated patients with issues ranging from acute episodes to chronic and severe conditions that bound patients to wheelchairs or walkers. Now they can walk again. The inspiring story of how Dr. Butler’s team at Oakland Spine & Physical Therapy has successfully helped and treated tens of thousands of patients. Learn about the true source of back pain and what you can do to stop it. How to keep back pain from returning. Take away a real and easy to understand plan of action that provides hope for the future. assurance with facts and knowledge. Don’t let the pain win. Dr. Butler is one of the best in the business and this is the perfect place to start your road to wellness. Learn more about Dr. Butler at https://drbradfordbutler.com.